In an industry where some of the finest exponents of watchmaking have histories dating back 200 years and more, Richard Mille is considered relatively young, launching its first models in 2001. 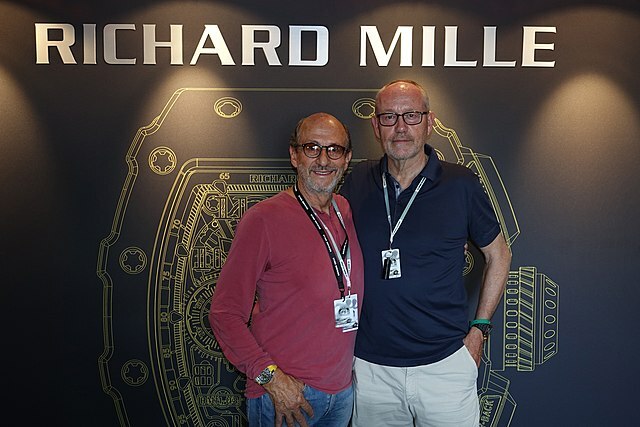 Richard Mille, the French founder of the company which bears his name, did not look to emulate existing watch brands but sought inspiration from the fields of aviation and motor racing. He chose to embrace new technologies and launched his first model, the RM 001 Tourbillon, to critical acclaim. This model was quickly followed by the RM 002 Tourbillon. These early models put in place some of the design codes and technical details for which Richard Mille has become known. The Tripartite case, widely used by the brand, is unusual and highly complex. It consists of three sections, held together with grade 5 titanium spline screws and abrasion resistant washers in a steadfast union. Richard Mille uses costly spline screws, rather than conventional flat-head screws, because they can be tightened to a predetermined torque and can be removed when necessary without fear of chewed screw-heads. The back of the tripartite case back often has its own unique contour, differing from the upper surface of the watch, ensuring an optimum fit with the wrist. The brand’s early models were solely delivered in tonneau-shaped cases but, over time, round and rectangular forms have also appeared in the company’s collection. Nevertheless, the tonneau shape will always be synonymous with the Richard Mille brand. When the RM 002 Tourbillon was released it used a titanium base plate, a first in watchmaking. The use of this light and strong material illustrated the incredible innovation of the young company. The brand, always at the vanguard of ingenuity, also went on to embrace baseplates made of carbon nanofibre, first seen in 2004 with the launch of the RM 006 Tourbillon. This watch weighed a mere 48 grams without a strap. An obsession with lightness is a theme which Richard Mille has repeatedly demonstrated over the years. The RM 009 Felipe Massa Tourbillon paired a movement made of aluminium-lithium with a case made of ALUSIC®, a silicon-aluminum alloy containing silicon carbide particles. The mass of this featherweight watch, sans strap, is an incredible 29 grams. Sapphire crystal is often used as the window-like structure positioned above a watch’s dial. In recent times it has been increasingly used on the case back of watches to grant inquisitive wearers with a view of the movement within. However, the release of the RM 056-1 Tourbillon Sapphire shocked watch fans with its transparent case made of the super-hard material. The sapphire crystal case took over 1000 hours to create, including 430 hours to pre-form the case and a further 350 hours to polish it to a flawless result. Needless to say, the time-consuming construction of the case, together with the complexity of the movement, was reflected in the price, which at the time of launch was approximately $1.65M. Horometrie SA was established in 2001, a joint venture owned by Richard Mille and his friend Dominque Guenat. The company is located in Les Breuleux near La Chaux-de-Fonds and is responsible for new product development, quality control of completed watches, as well as the assembly and casing of some of Richard Mille, watches. In 2013, the Richard Mille Group opened a further production facility, ProArt SA, responsible for case production and various movement parts. Richard Mille has always made the movements of its watches a key design element with mechanical components often revealed both dial-side and via exhibition case backs. The company forged a close working relationship with Audemars Piguet Renaud & Papi early in its life. This movement specialist has produced both Richard Mille tourbillons and split-seconds chronographs. The RM 007, Richard Mille’s first ladies’ watch, features a movement supplied by Soprod. Other movements have been produced by Manufacture Vaucher Fleurier. The oscillating mass featuring on the RM 005, Richard Mille’s first self-winding watch, released in 2004, included a variable geometry rotor. This allowed the inertia of the oscillating mass to be finely tuned for the wearer to take into account their lifestyle, increasing the winding process for sedentary owners or decreasing it for active clients. Many of the models within the Richard Mille collection are equipped with a function indicator permitting the wearer to select the winding (W) mode for the crown, the hand setting (H) mode or a ‘neutral’ setting (N). This system is reminiscent of a car gearbox and enhances ease of adjustment. The RM 012 Tourbillon tore up the rule book by mounting movement components, not on a conventional base plate, but attached to tubular rods. Despite Richard Mille exploring avant-garde materials and watch design, it has steadfastly adhered to traditional Swiss watchmaking craftsmanship. Various movement components including bridges, screws and tourbillon cages are expertly decorated and finished by hand. Richard Mille has selected Ambassadors for its brand who, in some instances. partake in very vigorous sports. This in itself would not be a problem, but to wear a watch whilst playing golf like Bubba Watson, volleying a tennis ball like Rafael Nadal or accelerating like F1 race driver Felipe Massa wouldn’t ordinarily be recommended. However, Richard Mille has deliberately exposed its products to the public gaze whilst they are subject to these harsh environments. In its short history, Richard Mille has gained a reputation for its highly complicated timepieces. The brand awareness has been heightened by engaging with famous names from the field of sport. However, it is the ingenuity of this watch company, with its use of materials and know-how from the fields of aviation and motor racing, which has brought the company to the attention of many watch collectors. Annual production is relatively small and pricing could never be described as accessible, hence exclusivity is assured when wearing a timepiece from Richard Mille. Browse Blowers’ selection of Richard Mille watches online today.